Steve Rauchman, M.D. > Information > Brain Damage > Concussions and Traumatic Brain Injury In Automobile Accident Victims: Unreported and Not Investigated! 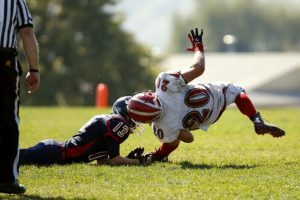 A significant percentage of concussions (head injuries) in the United States are caused by auto accidents. Only falls may cause a larger number of head injuries. This blog has shown this population of people often remain untreated for a variety of reasons. Research on mild traumatic brain injury (TBI) also tends to ignore these patients. Why is there a tendency to ignore this problem in auto accident victims? Some simple observations need to be made. Researchers like to concentrate their work on a uniform group of head injury patients that are easy to identity and re-examine. It makes research much simpler. What groups do researchers in mild TBI like to select? The answer is athletes and armed forces veterans. These are important groups- members of a college or professional team are well-organized and identified and can be easily plucked out for pre-injury testing and medical follow-up if a concussion occurs. Universities and professional sports leagues have a vested interest, and the resources, to take care of athletes. The NFL has lead the way. Veterans are taken care of in a separate health care system in the United States, the VA hospitals. Veterans tend to go to one hospital or clinic for care, and the records can easily be reviewed. Auto accident victims are a diverse group of people, different ages, different backgrounds, and do not always have access to care. Emergency rooms see some victims but this data is not easily summarized in a national data base. Many of the victims are poor and lack easy access to health care. As a result, researchers tend to overlook this population. This group is simply too big, awkward, and expensive to study. The other widely held belief is that such patients are malingerers and are faking injuries to get money. This is the reality of medicine- other diseases and other populations are simply easier to study and attract healthcare dollars. I don’t have a solution to this problem- obviously many victims of domestic abuse are also ignored. But as a clinical ophthalmalogist, I must address the obvious bias in looking at head injuries. Athletes and veterans deserve attention. The effort must be made to extrapolate research on these groups to the larger group of people who experience TBI in society. Just because a group is difficult to study does not mean they don’t have serious medical problems. Contact with insurance companies and attorneys does not mean these people are faking their complaints. TBI, like many complex diseases, is a societal and economic issue and medicine can only address a portion of the truth, and even that takes lots of resources.